Situated near Hoan Kiem Lake, the Old Quarter has a central position to attract global tourists who have Vietnam private tours. However, first- time travelers may not know about the long-standing history of such place. In the 11th century when the King Ly Thai To decided to choose Thang Long (Hanoi) for capital, Hanoi officially became one of the most crowded areas in the Indochina. After this historical milestone, both craftsmen and merchants gathered around the royal palace to sell their products. Day by day, it leads to the foundation of the various villages with specific purposes. For instance, Silver Street (Hàng Bạc) is prominent by silver jewelry or Silk Street (Hang Dao) with raw silk and ready- to- wear garments. Despite the modernization, these streets still remain the separate charm and make tourists be filled with nostalgia. Hanoi Old Quarter has a host of dazzling sceneries going along with many enigmatic tales behind. When you discover these places, you can hear untold stories which came from the locals. Constructed in 1889, Dong Xuan is one of the most prosperous trading places in Hanoi. Here you will witness the bustling shopping scenes with most of the goods are fabrics and clothes. In addition, merchants usually organize a meeting for buy- and- sell handmade products or second- hand ones. In particular, you can immerse into the turbulent ambiance of this market in the evening. The most useful advice is that try to bargain and always keep an eye on your belongings. If you have tours in Vietnam, you may not want to miss this extraordinary place. This ancient house allures tourists by its quaint grace. 87 Ma May is also one of the 14 oldest houses in Hanoi which were built in the early 19th century. Having gone through many ups and downs of history, the architecture of the house still preserved the unique structure of old pipe-shaped and plenty of antiquities. When you visit this house, you can broaden your horizons about the architecture of the past and imagine the daily life of residents who once lived in Hanoi Old Quarter. Ngoc Son Temple or “Temple of the Jade Moutain” located on an islet at the northern end of the Lake of the Restored Sword (Hồ Hoàn Kiếm), linked to the lakeshore by a curved scarlet bridge, constructed in traditional Vietnamese style. The temple is principally dedicated to Tran Hung Dao, victor against the Mongol aggressors (13th century) and the scholar Van Xuong (God of letters). 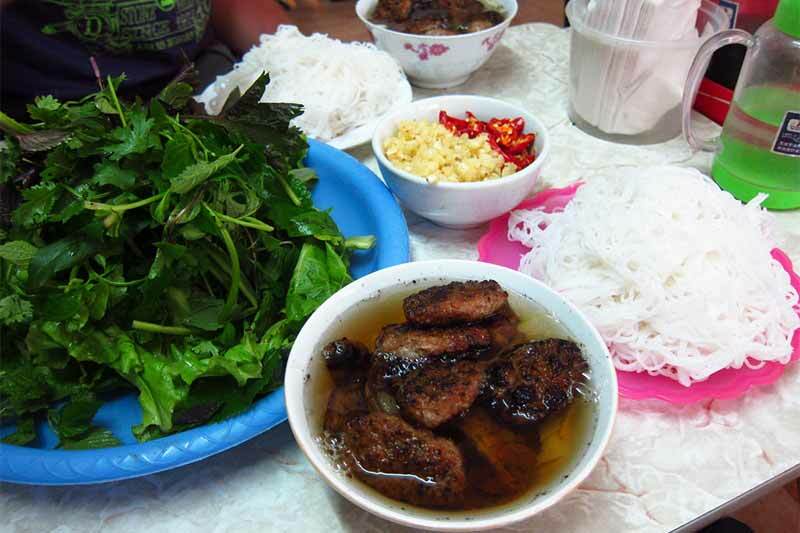 Many and many foreigners have heard about this prominent food of Hanoi and its appetizing taste. 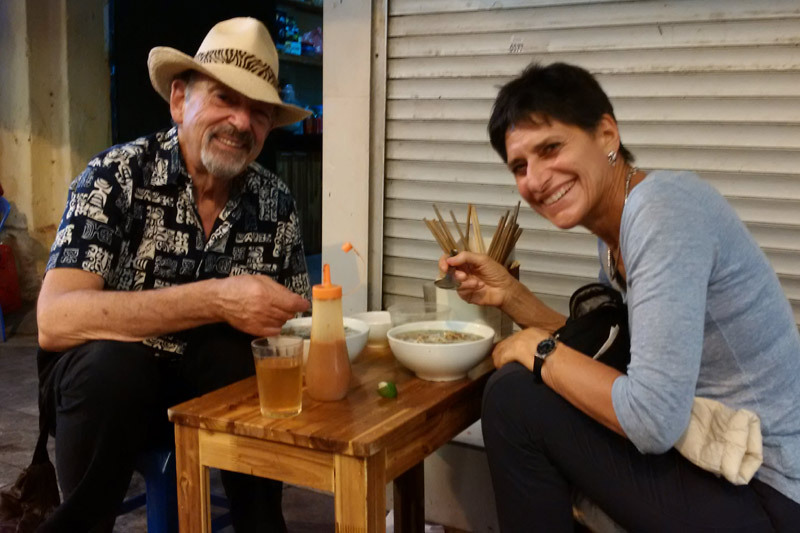 However, in Hanoi, Pho still maintains the traditional flavor and has the own glamour that nobody can resist. You have to queue for a bowl of Pho but it totally deserved. You can savor the harmonious fusion of beef broth and ultra-fresh ingredients at a reasonable price. All these components have to be slow- cooked and smelt in your mouth. Compared to many gourmets around, Pho Bo has a separate palate that satisfies all tourists’ demands. Although there are a small number of newcomers know about Cha Ca, it is regarded as unique street food in Hanoi. Cha ca is served with rice noodles, smooth basil, roasted peanuts, peeled onion and dill with a bowl of shrimp sauce or fish sauce elaborately prepared. After preliminary treatment, the chef cut the raw fish into pieces and fried them in oil right in front of the guests. All these ingredients are blended together to create a delicious taste of Hanoi’s cuisine. This dish is absolutely suited for Vietnam family tours or friend gatherings. If there is a chart for summer food in Hanoi Old Quarter, Bun Cha must be ranked second to none because of its fresh taste. First of all, pork slices are grilled on the charcoal so you can meet smoky flavor when tasting it. These grilled- pork then served with rice noodles, fish sauce and diced green papaya. You can also order some Spring Rolls (Nem) for a hearty meal. Banh Cuon is normally served for the breakfast in local markets or small restaurants. It is the perfect combination between the minced meat, ear fungus, cooked mushrooms and many layers of steamed rice flour. 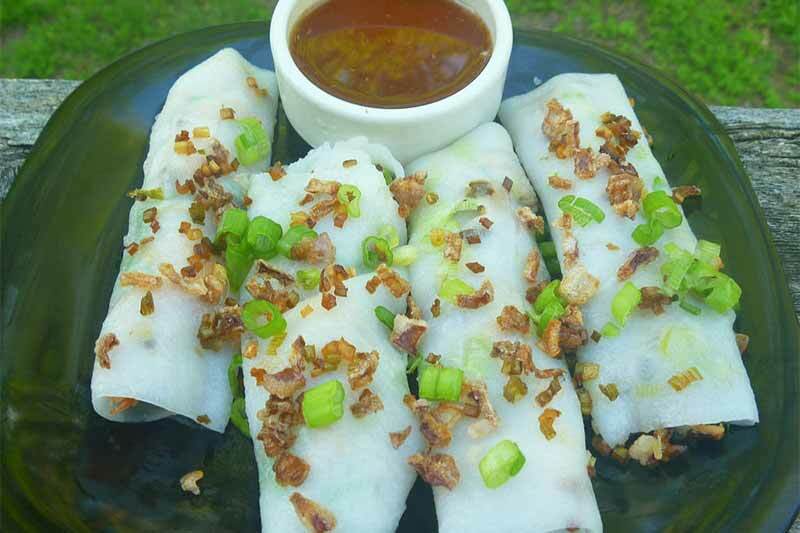 Banh Cuon is savored with Cha Que (Vietnamese roasted cinnamon sausage) and the sauce made from fish. Similar to many dishes in Vietnam, the sauce is essential and made from good fish sauce, sugar, pepper, boil water, chili, little of lime. 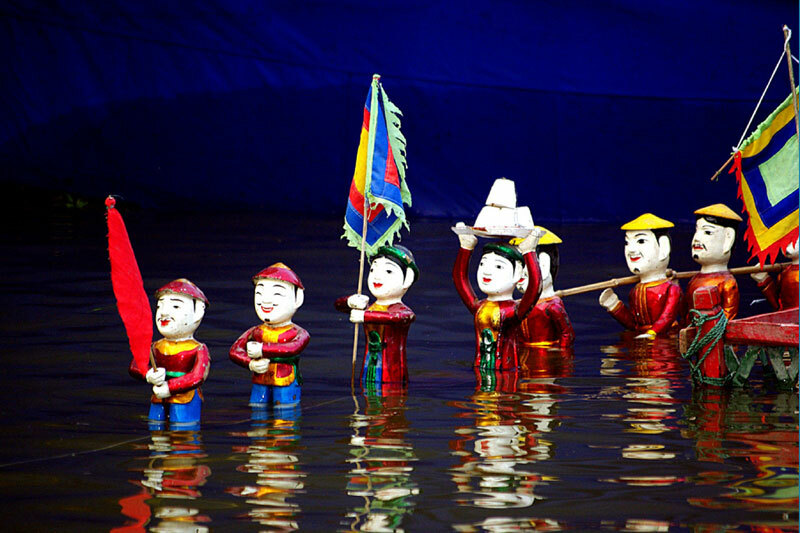 Water Puppetry is a particular activity in almost all of the Vietnam tailor-made tours. This is the outstanding folk art in Vietnam, a must-see show which attracts many tourists. Taking part in the show, you can see many puppets imitating daily activities of Vietnamese farmers on the surface of the water. All puppets are carved and decorated elaborately in order to impress outsiders and make them familiar with Vietnamese spiritual life. 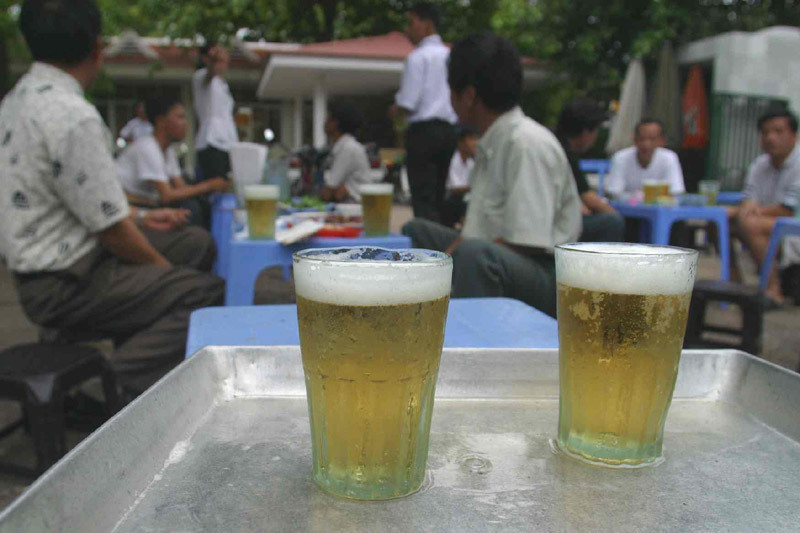 If you want to join with the vibrant pace of Hanoi, Ta Hien Street is the odd corner where you can meet local residents or have some chit chat with fresh beers. Located in the heart of Old Quarter, Ta Hien Street is always covered by many groups of youngster through the nights. Such a place is definitely the ideal position for people who want to blend into the Vietnamese community. Hoan Kiem Lake is the main spot for every tourist to visit when they are in Hanoi, but only later in the day. If you are an early bird and want to see another aspect of Hoan Kiem Lake, get here in the very early morning. You could see a lot of local people come to exercise, practice tai-chi, play sports around the lake. There are even some wet markets happened on the streets nearby for local people that will disappear by 7 o’clock. 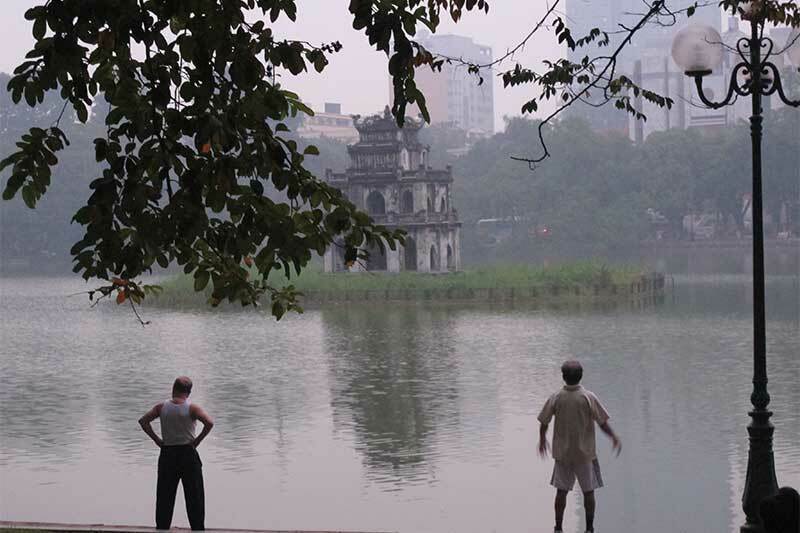 So, the earlier you can get to Hoan Kiem Lake in the morning, the better local life you can witness. How do people live in Hanoi Old Quarter?